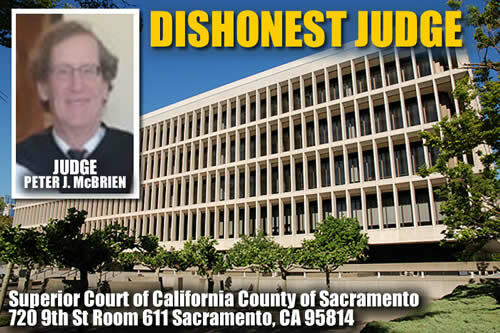 Sacramento Family Court News obtained a confidential court reporter transcript from the Commission on Judicial Performance prosecution of family court Judge Peter J. McBrien. The CJP is the government agency responsible for oversight and accountability of California judges. The document contains the complete 2009 oral argument by CJPprosecutor Andrew Blum detailing McBrien’s misconduct in the Carlsson case. The published 3rd District opinion in Carlsson – authored by three appellate justices without past employment in Sacramento County Superior Court- “developed a certain notoriety” throughout the state, according to Sixth District Court of Appeal Presiding Justice Conrad L. Rushing.Justice Rushing characterized McBrien’s conduct in the case as a “judicial reign of terror.” To view Rushing’s statements about the Carlsson case, click here. Court watchdogs point to the Carlsson case as one example of the preferential treatment family court judges provide attorneys who serve as temporary judges in the same court. Almost every ruling issued by McBrien in the case was in favor of the party represented byjudge pro tem attorney Charlotte Keeley, according to the 3rd District. As a result of the appellate opinion, which overturned McBrien’s decisions and ordered a new trial, the CJP charged McBrien with multiple violations of the Code of Judicial Ethics, including willful misconduct in office, persistent failure or inability to perform his duties, conduct prejudicial to the administration of justice that brings the judicial office into disrepute, and improper action within the meaning of article VI, section 18 of the California Constitution. Judge Peter McBrien noticed a bunch of oaks blocking his view of the American River, he had the trees chainsawed. Is that upholding the law?